Cutting boards at their core are designed for food preparation; which includes cutting, smashing, even pulverizing. It’s important to keep them up to the task by making sure they’re properly cleaned and sanitized. Continue reading to learn the proper way to clean cutting boards to keep them looking like new, while preventing cross-contamination in your kitchen. Butcher block cutting boards are made up of end grains, meaning the board’s surface consists of exposed wood fibers. Butcher block cutting boards are resistant to nicks and scratches and even self-heal over time, as the fibers will push back into place. Always wash your cutting board by hand only. Use anti-bacterial dish soap and warm water. If the cutting board is small enough, it is recommended to wash both sides. You can add a small amount of bleach or vinegar (a teaspoon per gallon of water) to the water for extra bacteria killing power. You can also rub the block with a half a lemon to kill bacteria. Never put a wood cutting board into the dishwasher. Wood is porous and moisture will seep in to it and damage the board. After washing, thoroughly dry the cutting board. If possible, allow the block to dry standing up on edge to help the block dry properly and prevent warping. For more tips on how to clean cutting boards, visit our website. 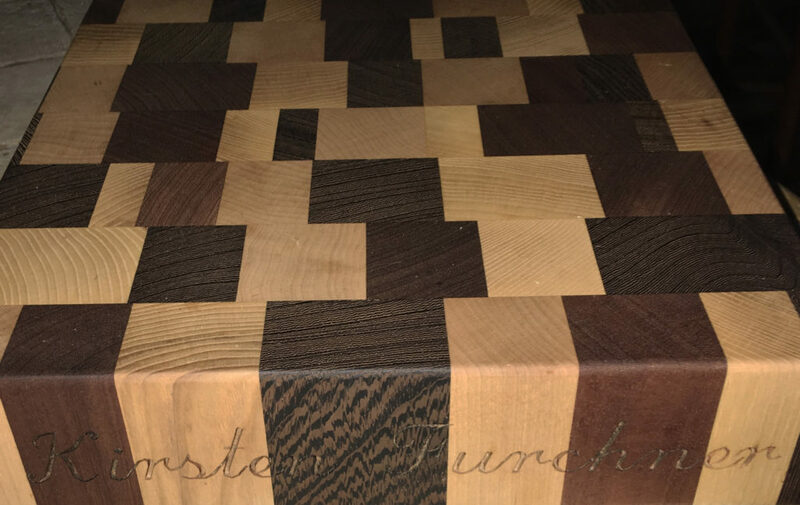 Cutting boards crafted by Grothouse make the perfect unique personalized gifts for anyone – including family, friends, and even clients – because they can be customized for anyone’s taste and budget. 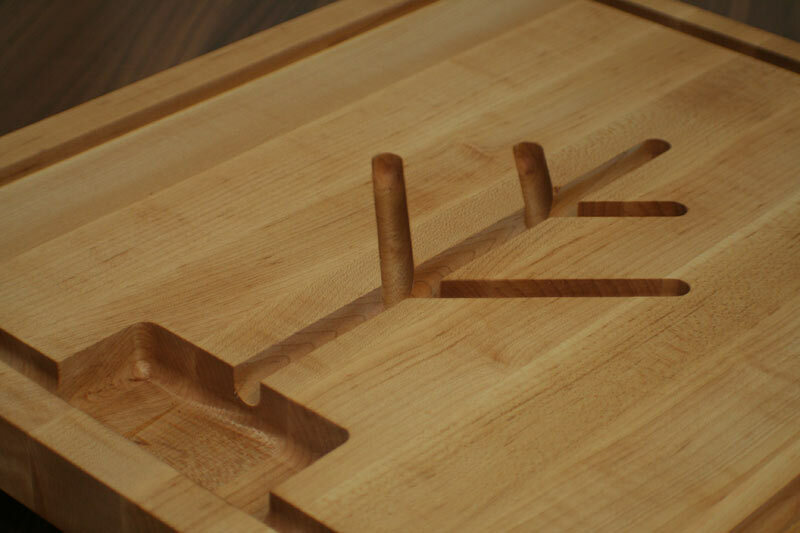 Designing cutting boards is easy when they are crafted by Grothouse because they can include a multitude of features – including laser engraving, edge profiles, and more. 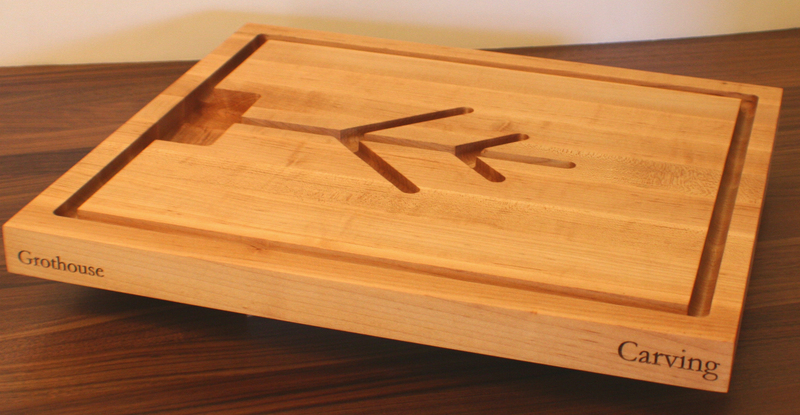 Anything can be engraved into a cutting board crafted by Grothouse. This is a major reason as to why they are such great gifts for clients. A company logo can be engraved as well as the client’s name if desired. 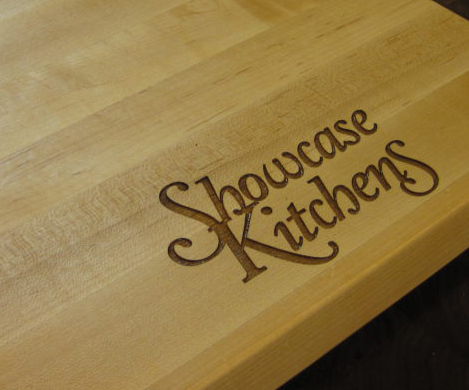 Showcase Kitchens designed this cutting board to feature their company logo. 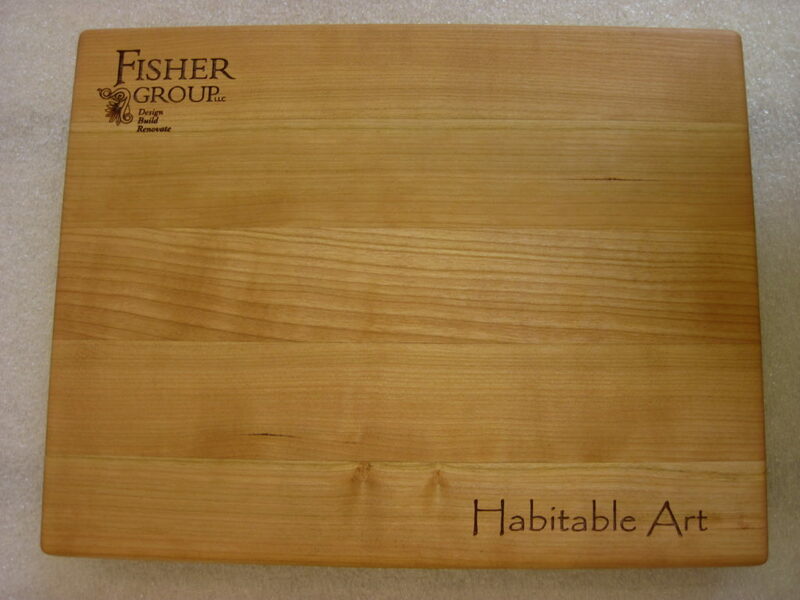 The Fisher Group designed the cutting board featured below to include their company logo in the upper left hand corner and “Habitable Art” in a different font style in the bottom right hand corner. This design is clever because it is not only personal, but also leaves plenty of space on the surface for food preparation. A special quote or design can be engraved on the cutting board for a family member or friend. The design does not have to be engraved on the top of the board. Designs can be engraved on the sides or even the back of the cutting board. One client had a cutting board custom crafted for their sister with engraving of their sister’s name on the front side. Custom cutting boards make for great event giveaway gifts as well. Cutting boards can be purchased in bulk and prepared for your event. Engrave the cutting board with event information or add a ribbon with a nice tag to each board that is given away. 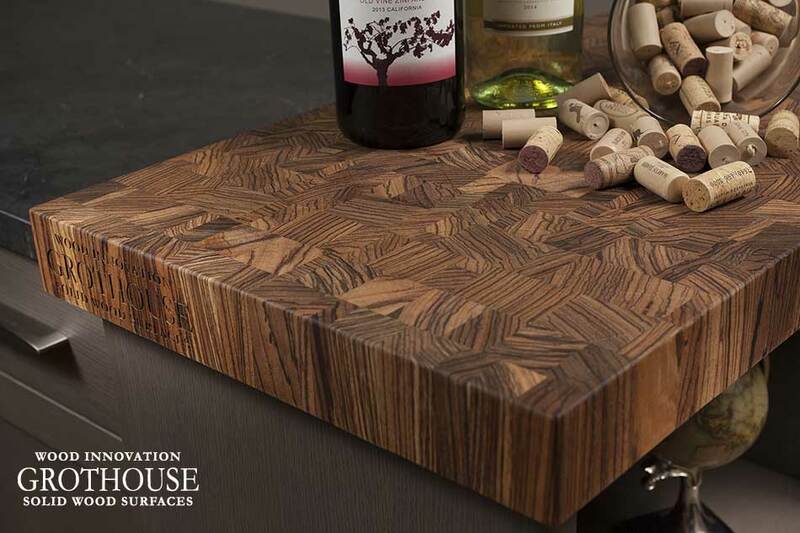 Grothouse has crafted cutting boards for events by House Beautiful magazine, Lehigh Valley Style magazine, and many more. Juice grooves can also be engraved into any cutting board. Juice grooves are a great feature because they collect fluids from cutting meat, vegetables and fruits to avoid drippings onto the floor or countertop. Juice grooves can be added in a simple design, like along the edges of the cutting board, or they can be added as a more complex design like the tree pictured below. Cutting boards can be custom crafted out of any wood specie. By choosing a cutting board crafted by Grothouse, you know you are receiving a board built out of the finest quality wood, no matter the specie. 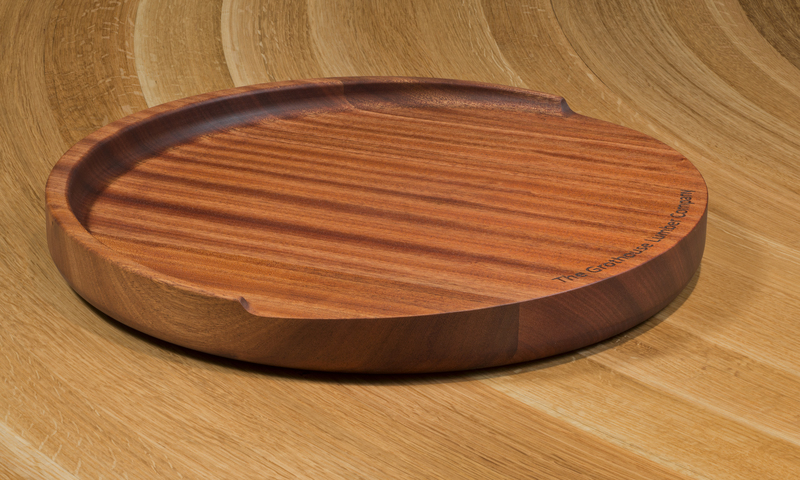 To keep the overall appearance of the wood cutting board simple, choose a classic edge profile like the Roundover. For a more dramatic appearance choose an edge profile like the Roman Notch or the Perlen. Per request, Grothouse can add feet to the bottom of the cutting board to sit on so that it does not scratch the surface it is placed on and so that the board itself does not scratch. Compliment the cutting board with a bottle of Grothouse Original Oil™. 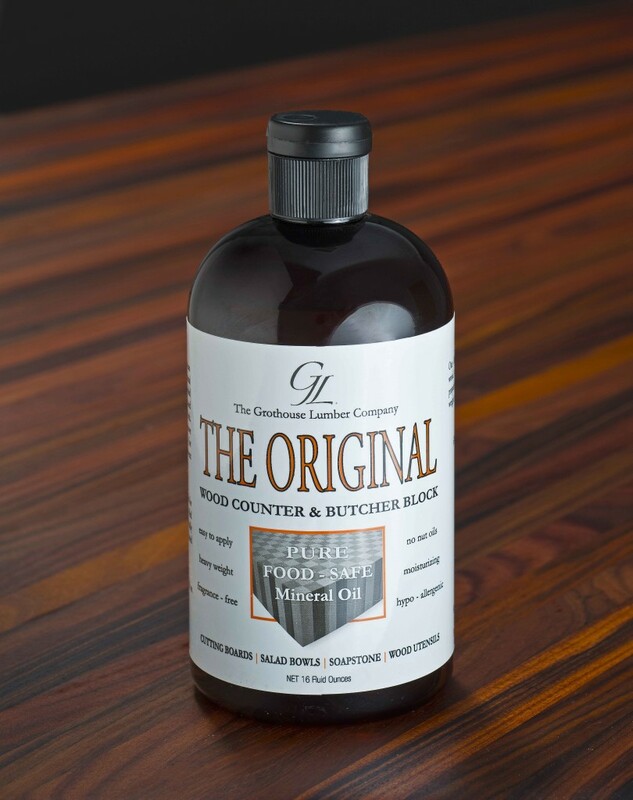 Our oil is the best wood cutting board finish for keeping the wood properly maintained. The finish is hypoallergenic and contains no Tung oils, permitting the entertainment of guests with no worries of nut allergies. It is also fragrance free and color free. When applied to the board, the wood may appear darker at first. Over time the color will appear lighter, as it looked before the oil was applied. Cutting boards should be oiled on a regular basis, depending on the amount of use and the environment it is typically stored in. Cutting boards need to be oiled when they appear visually dry. If you are interested in designing Unique Personalized Gifts crafted by Grothouse, request a quote by clicking here. Please contact us if you have any questions about our custom cutting boards! As decorating styles evolve and diversify, Grothouse continues to expand its product choices. The Trencher Cutting Board is a uniquely crafted working surface exclusively available at Grothouse. The gradual sloped design collects juices in the well at the back of the board—and away from the work area—making it a popular choice for slicing watermelon, citrus and carving meat. The ascending wall keeps flying vegetables, like carrots, at bay and confined to the cutting surface. The trencher reverses to a flat surface, perfect for slicing bread or serving hors d’oeuvres. The flat reverse side of the cutting board can also be used for general chopping and prepping tasks. The Trencher measures to be 15 inches in diameter and 2 inches in height. Only weighing 6 pounds, it can be easily transported from one area to another. The wood species is Sapele Mahogany. It has red and brown tones with iridescent stripes for a truly remarkable appearance. The trencher can be cleaned with mild soap and water. It is important to periodically oil the trencher with Grothouse Original Oil™ to ensure the surface is properly moisturized. To learn how to properly oil the cutting board, read the instructions here. Trencher Cutting Boards can include Laser Engraving. Anything can be laser engraved, from pictures to logos to words, the possibilities are limitless. 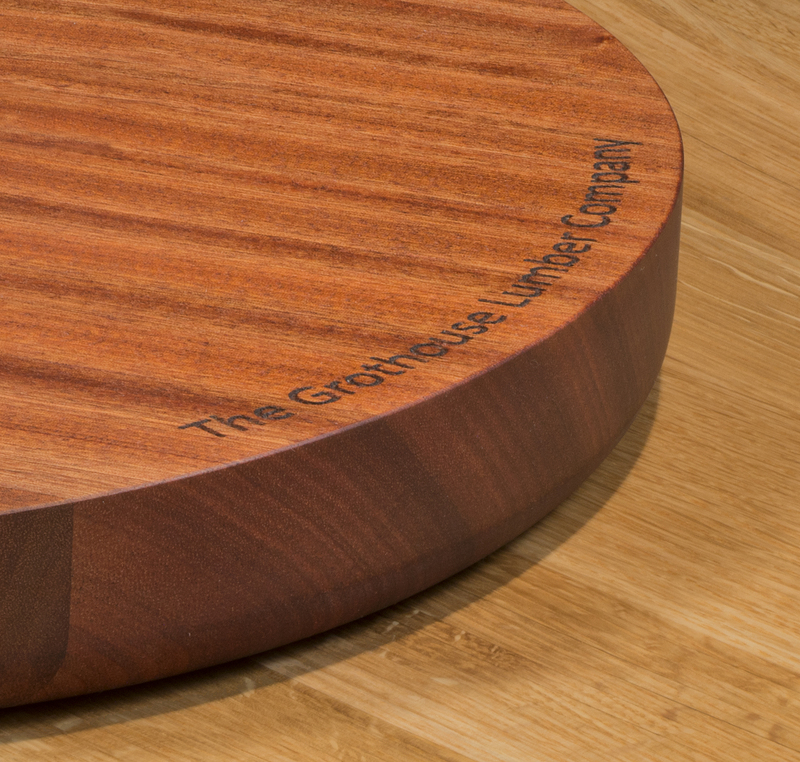 The text ‘The Grothouse Lumber Company’ in the trencher pictured was strategically placed at the end of the cutting board so that no crumbs get stuck in the engraving. This feature allows you to truly customize your trencher. Many designers use laser engraved cutting boards for Christmas gifts, charitable donations, and much more. The Trencher can be purchased on the Grothouse Online Store. For design inspiration, visit our Countertop Image Library. A classically designed cutting and serving board storage system, The Butcher Block Prestige Chef Box™ is designed to fill all of your kitchen food preparation and food presentation needs. The Prestige Chef’s Box includes a series of cutting boards, all fashioned with custom features for culinary endeavors, stored beautifully in a solidly built case. The standard cutting board size is 1-3/8″ thick x 16-1/4” deep and 18-1/8″ wide. The cutting boards are crafted in edge grain construction. The boards can be ordered in any of the wood species we offer. The depth and width can be adjusted to meet your specifications. Clients can customize the topography of each board based on the intended use. The cutting board pictured below includes juice grooves around the outside of the board and in the center of the board creating an image of a tree. Juice grooves are great for carving meat because all of the juices collect in the grooves, allowing a clean preparation space. 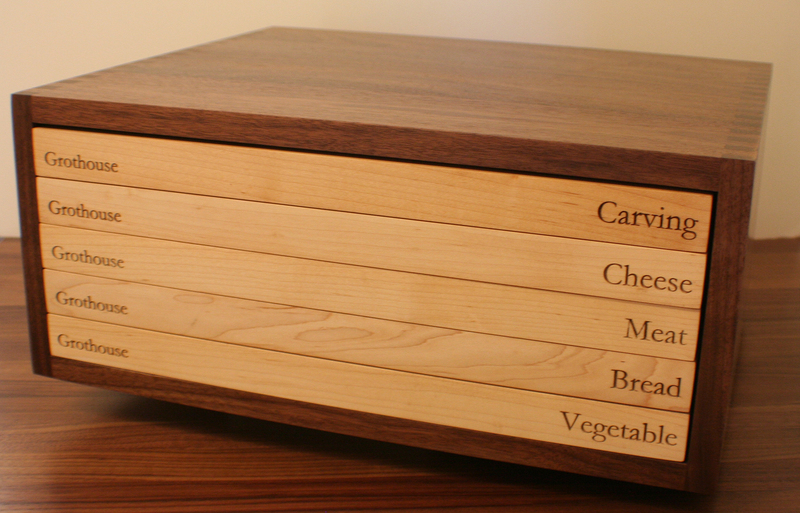 A hand made, all solid hardwood box is custom designed to hold your size and number of cutting boards. 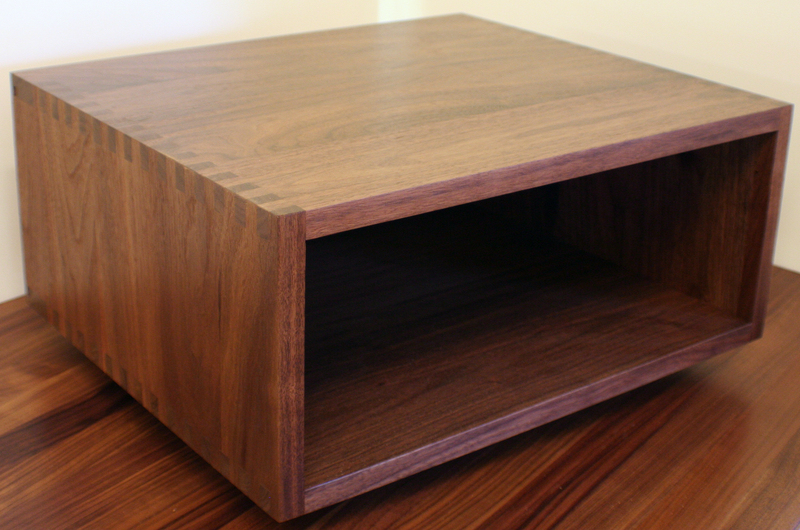 The case is assembled with box joint joinery. The case can be ordered in any of the species of wood we offer and will be automatically sized to fit the number of cutting boards and size of cutting boards you specify. The typical thickness of the box walls are 3/4″. You can choose a 3 drawer or 5 drawer configuration. Rubber feet are standard and will be installed on the bottom of the case. The standard finish for the cutting boards is Grothouse Original Oil™. Durata® Waterproof Permanent Finish is not recommend for the cutting boards. This is because most food preparation applications include cutting or chopping, which would scratch the finish. The standard finish for the case is Durata® Waterproof Permanent Finish in Satin sheen. 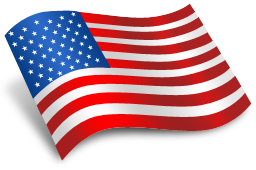 The case may be custom stained or may include any of our stock stains if desired. The cutting boards are finished with Grothouse Original Oil™. You will need to care for the cutting boards by oiling them. A good rule of thumb is a minimum of once a week for the first month after you receive your box and monthly thereafter. The frequency will vary based on the environment and amount of use. The boards should be oiled when they appear visually dry. » Letting a board dry out because of a lack of oil is the #1 cause of problems of cutting boards. Oiling will help keep that beautiful sheen and create the desired patina. It will also prevent cracking. » You can wash your surface by hand using anti-bacterial dish soap and warm water. If required, add a small amount of bleach or vinegar to water for extra bacteria killing power. » Use a steel scraper to keep the top free of food build-up. When required you can use 220 grit sandpaper to keep the top smooth and free of knife marks. For deeper cuts, start with 150 grit sandpaper and then use to 220 grit sandpaper to finish. Always oil the top after sanding. » Do not expose cutting boards to excessive heat, cold or moisture! Never put in a microwave or dishwasher. Never place on stove burners. » The Durata® case can be cleaned with soap and water; furniture polish may also be used if desired. » Please allow 30 days for the Durata® Finish to fully harden after receipt of your box. You can learn more information about the Prestige Chef’s Box on our website. To order your very own, Request a Quote.